Android has evolved over the years with lot of new features added on every release. But did you notice? Whenever you want to record and showcase your gaming skills or you want to record a tutorial on how to use certain mobile App, you required a Mobile Screen Recorder for Android. I assume that is the basic feature everyone wanted to have it in Android OS. Recently OS developers are coming up with this in-built feature of Recording Mobile Screen. I use RedMI Note 3 mobile and it has pre-built Screen recorder app. MIUI embedded Mobile Screen Recorder app with later versions. Similarly iOS also introduced in-built screen recording app in iOS 11. There are tons of Screen Recording apps out there in Google Playstore. Which one you should choose? What are the best features of each one? Whether it contains Ads? We are going to help you answering these questions and list down Best Screen Recording Apps for Android. We have gone through most of the screen recording apps available on Google Playstore. Noted down each ones pros and cons, Playstore ratings, user reviews and installations. After analysing each one we came up with the below list. Out of all the available Screen recorder apps, DU Recorder tops the list with it lightweight, free and high quality video recording. You can record Video calls, Game videos, live shows etc without any hassle. One of the best advantage of this App is it doesn’t have any Ads and no rooting is required to use. You can record high quality videos of 1080P, 12 MBPS, 60FPS with DU Recorder. Apart from just screen recording, it has features like Video Editing, Screen Capturing, Live broadcast, Image and Screenshot editors. 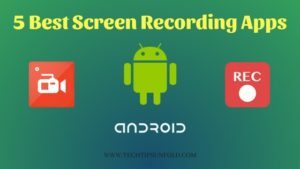 AZ Screen Recorder has featured on Google Play Homepage, CNET, Android Police, Android Central as one of the best Screen Recording Apps for Android. The only reason why it is not on the first position is, AZ Screen Recorder contains Ads. You can record you screen without any time limit with this App. HD and FullHD recording options are available and you don’t need rooting to use AZ Screen recorder. It has very simple and easy to use GUI. It has a magic button that allows you to control your record settings without appearing on recorded video. Another popular Screen Recording App for Android is Twitch. This Screen recording app is developed for Gamers. You can live stream your gaming videos and chat with your fellow gamers using this app. You can also watch others live stream gaming videos, Esports and any other IRL broadcast videos. If you are a Game lover, then this App is for you. You can play all the available games at one platform and complete/chat with players. This App contains Ads and its free to use. Google play games is designed by search engine giant Google itself. Similar to Twitch this app is also designed for Gaming purposes but you can use it for Android Screen Recording. You can record and share your best game moments with your friends. Just start the video recording option and you can record whatever you want. Google play games App has enormous installations and best ratings. This app is free to use. Google play games contains no ads. So the last one in our list is Mobizen Screen recorder. This app is designed only for Screen recording. You can record your face using front cam along with screen recording. This feature is useful for making any tutorial videos. Another best feature is you can keep your favourite BGM and personalise the recorded video. You can use Mobizen Screen Recorder without rooting. Initially you will get watermarks and you can remove it for free. This app contains Ads. We have listed down the best of available Apps for Screen Recording. For you to choose one and install, make a note of following features. Select the one which matches your requirements. You can choose DU Recorder or Mobizen Screen Recorder if you want Video editing features also along with just screen recording. If you are a game lover, then go for Google play Games or Twitch. AZ Screen Recorder is very simple and easy to use. There are other good apps in the top 10 list. But you can select the listed top 5. Here is the full list I have prepared. If you are using MI smart phones or iOS 11, then better to choose in-build screen recording Apps other than searching for other options. With this I’m concluding this list of Best Screen Recording Apps for Android. If you come across any other best alternate option, do let us know through your comments. We will add that to our list. Cheers! How to Check Android Version You are Using?